The University of Charleston in West Virginia has opened up a new a facility for students looking to enjoy live sporting events with peers. The university’s Innovation Center, which opened earlier this month, aims to enhance the sports viewing experience with attention-grabbing, easy-to-use LCD displays from Advanced, an audiovisual and collaborative communications company based in Orlando, FL. Advanced installed two Planar LCD video walls, one of which hangs as a 6- by 1-panel welcome banner at the building’s entrance. The other serves as the 3- by 3-panel central display fixture in an “entertainment hub” space, according to a press release. Additionally, the company installed a Crestron Control System that allows staff to easily control the displays from a 7-inch touchpanel located at the center’s reception area. In addition to its basic functions, the touchpanel can be used to control the format of displayed content (for example, showing a single image or splicing an image into two or three images). U Charleston began its $16.5 million construction upgrades for the sports and academics facility nearly two years ago. The building was born from a renovation of the university’s gym – the only building to not receive any upgrades during the $100 million overhaul of campus infrastructure over the last 10 years, according to reporting from the Charleston Gazette-Mail. 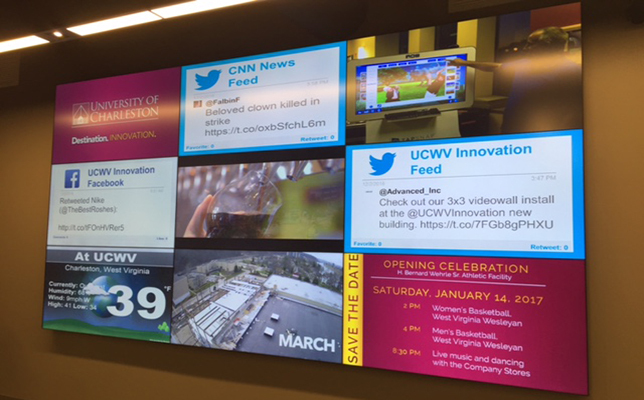 Since the Innovation Center’s opening, the university has used the displays to relay school information and to broadcast live sporting events. 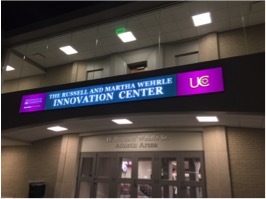 A video tour of the new Russell and Martha Wehrle Innovation Center can be viewed below. To learn more about the displays, visit the Advanced site.